Often times, menus at Walt Disney World are praised for their unique use of texture and flavor. If there is a fault in the menus to be chided for it is the lack of options for picky, finicky eaters or those trying to adhere to a specific diet. A recent visit to the United Kingdom’s Rose and Crown has me convinced that it is one location that can meet a variety of requests and palates, and still retain its cultural identity. Frequently thought of for only its alcoholic refreshments, the range of pints and half pints of the Rose and Crown serve as a nice base to start off, or as accompaniment to the meal. 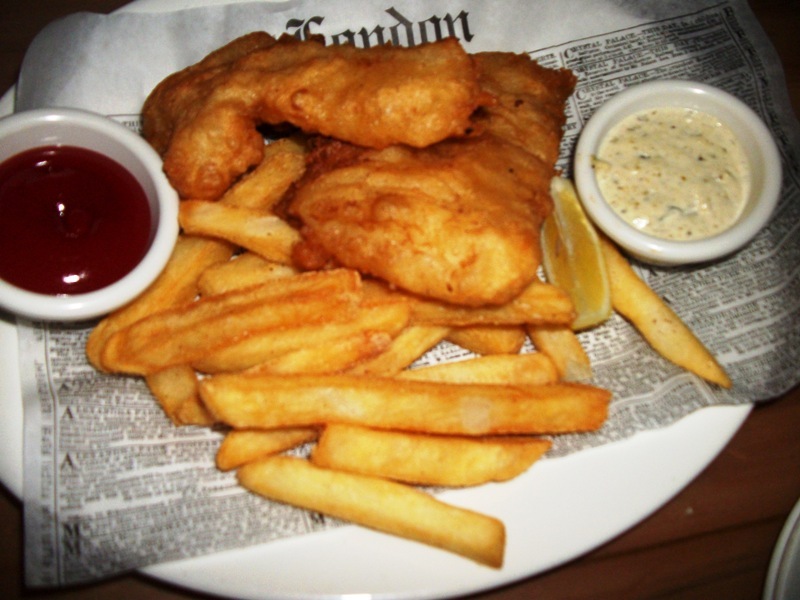 The restaurant itself struggles with the same perception its host country has been facing for decades, and that is that the fare of the United Kingdom is bland, lacking essential ingredients, and forced to utilize the niche market of the nasty bits. While isolated from land routes that could have brought it a wealth of spices, the United Kingdom’s cuisine exemplifies the ability to create masterful dishes with what is readily available, and the Rose and Crown illustrates this point perfectly. 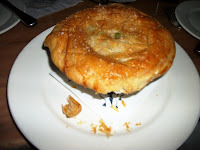 The group I dined with at the Rose and Crown selected the Chicken and Mushroom Pie, Vegetarian Shepherd’s Pie, and the classic Fish and Chips with the addition of Mushy Peas. The selections available alone show that there is something for everyone, as seen by our entrees. The Chicken and Mushroom Pie had a buttery crust that could be flaked off layer by layer if so desired, but was much better when combined with the steaming mixture of chicken, mushrooms, peas, and other contents of the pie. 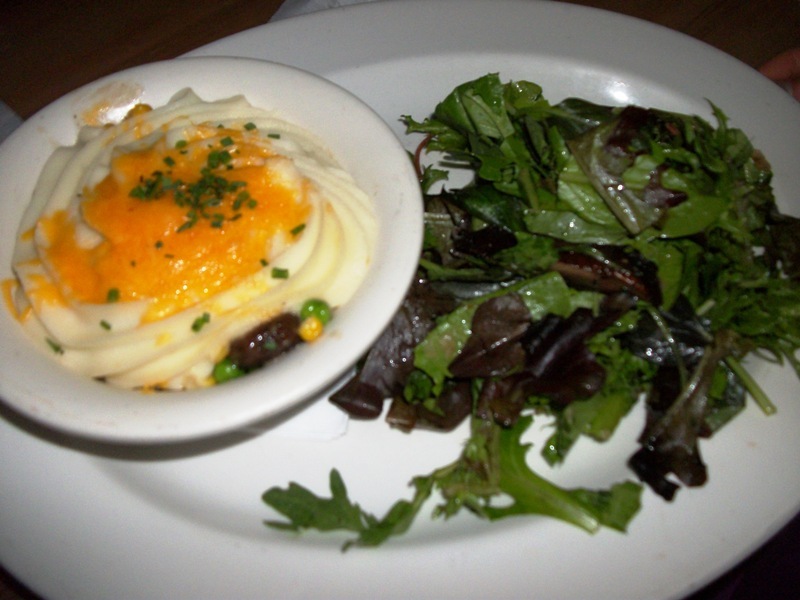 The Vegetarian Shepherd’s Pie not only showcased a talent for combining and cooking vegetables, it also makes the perfect meal for a guest who may not be ravenous. The light and crisp dressing and selected greens of the Mixed Greens made the perfect addition to vegetarian meal. The Fish and Chips, using fresh cod, were good quality, but have a better taste and value at the Yorkshire County Fish Shop down the lane. As for the Mushy Peas, the blended vegetables with a hint of mint could be used to enhance any dish. While we did not partake of the Rose and Crown’s dining room, the décor of the dining areas crosses through a variety of pub styles, from simplistic and eclectic to a grandmotherly elegance, which made the restaurant feel warm and welcoming. Situated along the lagoon side of the World Showcase promenade, the Rose and Crown is one of the few restaurants that is able to offer a view of IllumiNations: Reflections of Earth to its patrons. The upper and lower terraces of the restaurant afford great views of the lagoon and nighttime spectacular alike, and a peaceful place to while away the afternoon with friends and family enjoying have a meal of comfort foods. The Rose and Crown breaks with conventional ideals across the board. 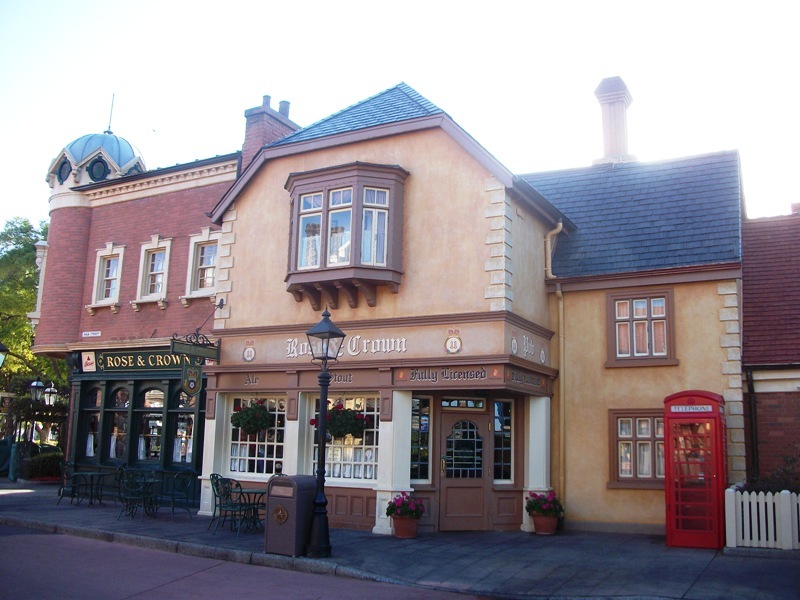 From the ill-conceived notion that the gastronomy of the United Kingdom is not as appetizing as other world cuisines to the long held belief that a single menu at Walt Disney World cannot be crafted to reach out to all guests. I would certainly return to the Rose and Crown for another meal, especially if I were famished in order to partake in the array of appetizers and Sticky Toffee Pudding.